A dental amalgam contains a mixture of metal, including liquid mercury. With roughly 50 percent of the filling composed of mercury, the filling is able to bond better to the tooth. However, the mercury used for fillings is now under scrutiny because the fillings release low levels of mercury vapor, which can be inhaled and absorbed onto the lungs. While low levels of mercury are considered to be safe, the vapor of mercury is known to cause complications with the brain and kidneys. When you combine the potential health risks with the noticeable appearance of metal, many now have their metal fillings removed. We remove a number of amalgam fillings and replace them with a safer alternative. 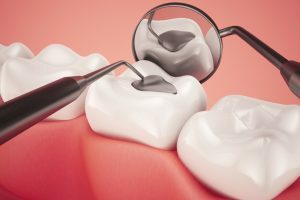 Using composite fillings, we are able to restore the tooth’s function using a less noticeable solution while eliminating the risks associated with mercury. Composite resin fillings are completely metal-free. Instead, the white-colored filling is made with a plastic and glass mixture that’s used in layers to restore a tooth. The resin is customized to match the enamel color of your existing teeth for a seamless repair that’s nearly unnoticeable to the naked eye. Since the resin in easily molded and very versatile, it can be used for cavities and a number of other procedures as well, such as fixing chips and cracks. We are able to easily remove the fillings made of metal to replace with an enamel-colored filling. After removing the old filling, we will check the tooth to make sure no other procedures are needed. Then, we will fill the cavity with the resin material after cleaning the tooth. Using a special light, we will quickly harden the filling. Finally, we will shape the tooth and filling to ensure its functioning correctly and looking the way it should. With the right care, these metal-free fillings are strong and durable so they will last for years. However, we will check the fillings at each routine appointment to check for damage. If damage has occurred, we will repair the filling to maintain the tooth’s structure and function. At Los Fresnos Dental Center, we make it out mission to provide healthy, beautiful smiles to last a lifetime. If you have an old filling hurting the appearance of your smile, schedule an appointment today to replace it with a tooth-colored filling.